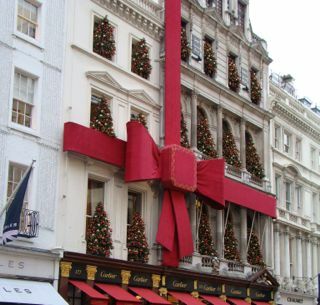 At Christmas time, a walk around London has its own special magic as you explore and experience the city in the cold. Francesca Fenn from Step Outside Guides shares some very special Christmas places, past and present, to warm your heart, teach you about our capital's history (for free!) and get you into the festive spirit. If you want to see how people used to celebrate Christmas, head for the Geffrye Museum. These beautiful almshouses just east of The City make up the ‘museum of the home’ and each year the period rooms are dressed up for Christmas just as they would have been when the rooms were first built. 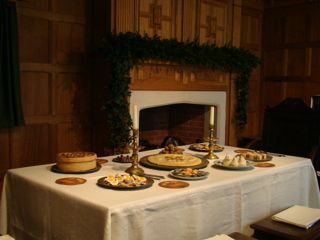 This creates a fascinating timeline of ‘Christmas through the ages’, in the English home. The museum also offers festive family activities, a cafe and a beautiful shop. Entrance is FREE! Geffrye Museum, Kingsland Road E2 8EA. Nearest station; Hoxton, on London Overground. A walk around ‘posh London’ at Christmas time, especially after dark when all the lights are twinkling, is a really beautiful stroll. Burlington Arcade, off Piccadilly, is the longest and oldest arcade in the UK. It was built nearly 200 years ago, in 1819, and it looks as if it has sprung straight from a story book! Beautiful shop windows, fabulous decorations, with red carpet from beginning to end make this a magical arcade. Parallel to Burlington Arcade is Old Bond Street, a narrow street where some of the world’s most famous designers and jewellers have shops. The decorations in the windows and outside the shops are spectacular, and a stroll along here is breathtaking! Back in Piccadilly, turn left and look for Fortnum and Mason’s, a department store on the other side of the road. Their window theme this year is ‘Puss in Boots’ and a part of the story decorates each window. Nearest Underground stations: Green Park, Piccadilly Circus. The family carol service at St Paul’s Cathedral lasts for 45mins, and it is a wonderful opportunity for you to sing and listen to carols in one of London’s most beautiful churches. Designed and built by Sir Christopher Wren after the Great Fire of London, St Paul’s is often seen as a symbol of London, with its dome rising above the surrounding buildings. Its interior is as spectacular and beautiful as the outside. 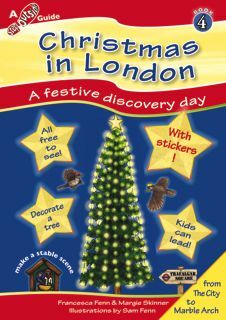 Step Outside Guides’ ‘Christmas in London’ offers a cost-free family day exploring the capital. Starting and finishing at tube stations, the book guides you on a festive discovery trail, complete with stickers, enjoying London’s seasonal highlights and showing you all sorts of festive surprises. Written so that children can be in the driving seat, Step Outside Guides cost £5 each and are available for next day delivery from stepoutsideguides.com, Amazon and selected book shops and museum shops.